Windows 7, Microsoft’s latest version of the Windows operating system, has all the familiar boxes, windows, and mouse pointers as its predecessors. But Windows 7 also has some new features to explore. This cheat sheet of timesaving tips and advice makes using this new version easy. Get to know required hardware, how to protect your work effectively, and some cool keyboard shortcuts to get that job done faster — and with fewer hassles. Note: Because of legal issues in Europe, Microsoft considered releasing a special “E” version of Windows 7 in Europe that wouldn’t include Internet Explorer. The company changed its mind, however, and now Europeans will receive the same version of Windows 7 sold around the world. When Europeans first install Windows 7 or turn on a new Windows 7 PC, they’ll see a ballot screen letting them choose their preferred browser, be it Internet Explorer, Firefox, or another browser. Choose the browser, and Windows 7 automatically installs it, if necessary, and begins using it. Microsoft hadn’t released the final version of Windows Live Movie Maker in time for the first printing of this book. Check out Windows Live Movie Maker: Create, Edit, and View Movies for information on the final release version of this product. Many people are dragged into using Windows 7 without a choice because their new computers probably came with Windows 7 installed. 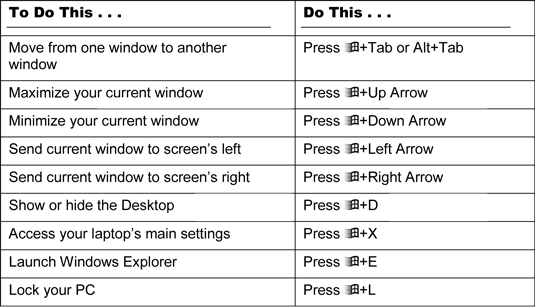 Working in Windows 7 isn’t so hard if you consider the helpful hints in this list. You’ll save time and prevent a headache or two! Don’t know what a certain button does in a program? Rest your mouse pointer over the button for a few seconds. A helpful box often pops up to explain the button’s purpose. If you’re baffled, try pressing F1, that “function key” near your keyboard’s upper, left corner. A Help window appears, often bringing hints about your current problem. To see what you can do with something in Windows, right-click it. A menu appears, listing all your available options. Press Alt to reveal any hidden menus in any program, including Media Player. 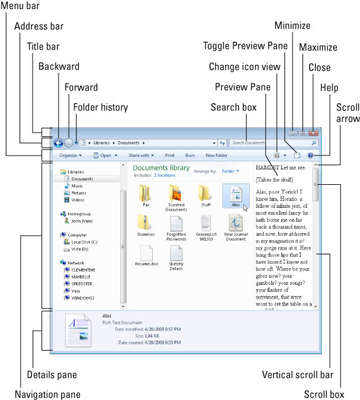 To find lost windows on the desktop, hold down Alt and press Tab. Windows displays thumbnail images of open window. Keep holding down Alt, press Tab until Windows selects your desired window, and then let go of Alt to bring that window to the top. To share files with all the users of your computer, copy them into one of Windows’ Public folders: Double-click the name of any of your libraries, and two folders appear. The folder named Public is accessible to everybody on your PC (and even a network). If your computer acts weird after you install new hardware or software, use System Restore to set it back to a time when it worked. Click All Programs from the Start menu, click the Accessories menu and choose System Tools, and then click System Restore. Retrieve accidentally deleted files and folders by opening the Recycle Bin on your desktop. Right-click the deleted item and choose Restore to return it to its original location. To return to an older version of a file you’ve changed, right-click the file and choose Restore Previous Versions. When Windows lists the date of the version you want to retrieve, click the Restore button. button and then click Cascade Windows. window violently with the mouse. Windows 7 is powerful software and it requires equal power from the PC it runs on. If the PC doesn’t meet requirements for Windows 7, it won’t run the software very well. See how the hardware stacks up by visiting the Windows Welcome Center: Click Start, right-click Computer, and choose Properties. Look in the window’s System area to see its hardware stats. Here’s a quick look at what a PC needs to run Windows 7 well. If you receive an e-mail from a financial institution saying that something’s wrong with your account, and you need to fix the problem by clicking the link and entering your name and password, don’t do it. That e-mail came from a fraudster trying to trick you. Ignore it. If you have questions, visit the institution’s Web site by manually typing the link into your Web browser.